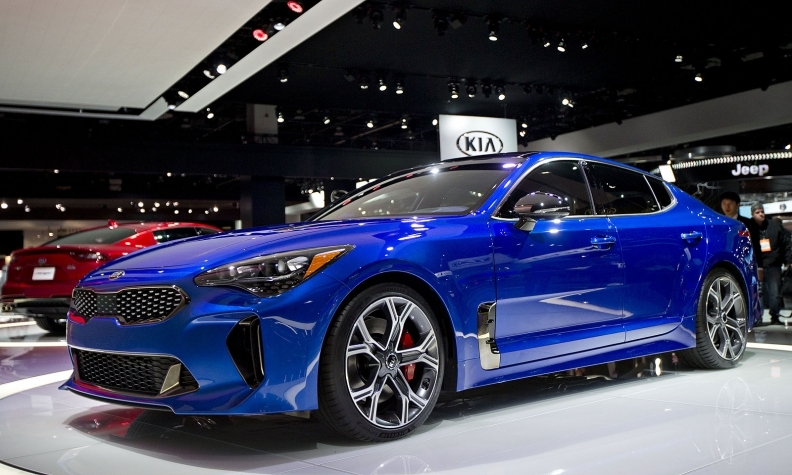 Kia's Stinger sport sedan is available in only two trims in Canada and both come with standard all-wheel drive. In the United States, all-wheel drive will be a US$2,200 option on all models there. The 2018 Stinger is priced from $45,755 to $51,555, including shipping, in Canada and is available at dealerships now. Kia Canada says more than half the sedan’s 2017 availability is already sold. Kia is using pricing and simplicity as tool in its fight against the luxury establishment. The Stinger will be available in just two trims, the Stinger GT and the Sting GT Limited. The Stinger GT will start at $45,755 while the Stinger GT Limited will be priced from $51,555. Both prices include shipping. A 365-hp, 3.3-litre twin-turbocharged V-6 engine, an eight-speed automatic transmission and Brembo brakes are standard on both models. The Stinger GT Limited includes options like an eight-inch multimedia interface with navigation, heads-up display, smart cruise control, dynamic bending headlights, lane assist and an autonomous emergency braking system. The Stinger's base price will put it well within reach of buyers looking at other luxury sport sedans from the premium compact sedan segment's stalwarts such as BMW, Mercedes-Benz, Audi and Lexus. David Undercoffler of Automotive News and Greg Layson of Automotive News Canada contributed to this report.